BDCU was the winner of Excellence in Social Enterprise. From left Allen Cupit, Jenna Rudkin and John Turner. Photos courtesy of the Goulburn Chamber of Commerce and Rachael Cramp. 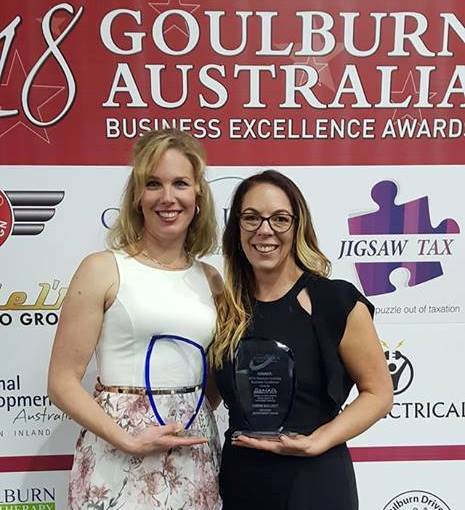 The 2018 Goulburn Business Excellence Awards drew a capacity crowd on Saturday night, underscoring the strength of the local business community and a regional economy on the move. “It was the largest gala dinner to date held by the Chamber with 180 people attending. Businesses booked tables and brought staff to celebrate. We were sold out and at maximum capacity,” Goulburn Chamber of Commerce and Industry Committee Member Prue Martin said. The awards were held at the Goulburn Mercure Hotel and attracted 130 nominations across 11 categories. Nine of the category winners will go on to compete in regional and, if successful, NSW awards. But for the capacity crowd on Saturday night, the event was all about local business and community. “It was a night of excitement and celebration of our local business community. It was an opportunity for everyone to get around and see other businesses, and to enjoy our community in Goulburn,” Prue said. With population for the region trending upward, the awards night reflected the diversity, innovation and strength of the Goulburn economy and the opportunity for businesses who can meet the needs of a growing customer base. 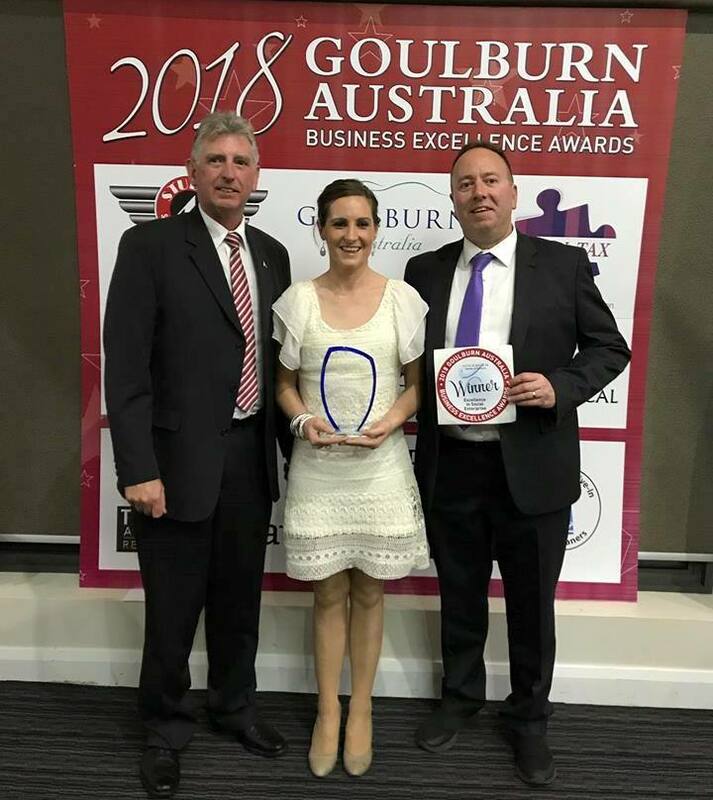 “Our local Member of Parliament Pru Goward who presented eight of the awards said it very well: There is so much growth and development in Goulburn and we can all benefit,” Prue said. However, business longevity could best be secured by providing good customer service and the products and services needed by existing and new residents. Congratulations to Goulburn Physiotherapy Centre. GPC took home two awards. Karen Waters was Winner of the 2018 Business Leader Award and Corrine McElligott was Winner of the 2018 Excellence in Customer Service Award. “Goulburn’s location is both a positive (for attracting new residents) and a negative because Canberra and Sydney are so close. Our local businesses need to offer products and services required by locals because if we can keep them buying locally, we won’t lose their business,” Prue said. The evening was hosted by Deputy Police Commissioner Gary Worboys, a standout for the event. Recognising the hard work that goes into local business success was also a theme for the awards, with the gala dinner providing an opportunity to celebrate hard-won achievements. For the winner of the Excellence in Sustainability Award, Goulburn Solar, the award was a culmination “of a lot of hard work”. “We’ve been in the industry since 2010 and it’s exciting that having recently launched our Goulburn Solar brand to let people know there are options locally and to support local, and to try and give as much advice to people so they can best know what to do, this was unexpected and very, very good,” Managing director Stuart Joyce said. Business Leader of the year – Karen Waters of Goulburn Physiotherapy Centre. Daniels Auto Group Excellence in Customer Service Award – Corrine McElligott of Goulburn Physiotherapy Centre. JDY Electrical Trainee/Apprentice of the year – Jacob Clack of Choice Interiors. Young Entrepreneur of the year – Diana Cheetham of Diana Cheetham Hair and Makeup Artist. Excellence in Innovation Award – Workspace2580. Excellence in Social Enterprise Award – BDCU Alliance Bank. Excellence in Business and Employer of Choice awards were both won by Warrigal Community Care Goulburn. Start-Up Superstar Award – Tennille Skelly of Dream Admin Services. Excellence in Small Business Award – Dean Seeley of Goulburn Transfers & Tours. Excellence in Sustainability Award – Goulburn Solar. For more information on the awards and the Goulburn Chamber of Commerce, visit the Chamber’s Facebook page. 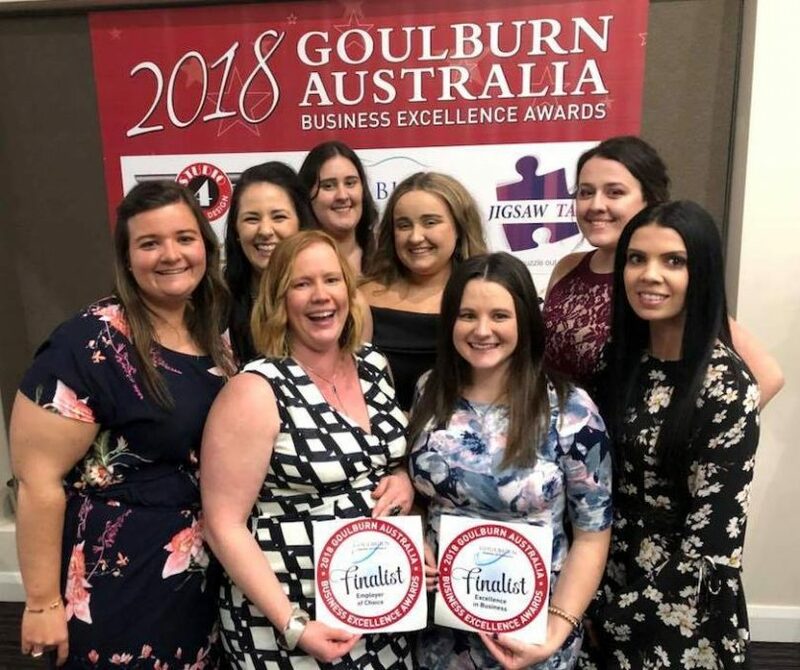 Finalists were also announced at the awards and the team from Allens Training Goulburn were celebrating: Brooke Stephenson, Tracy Fry, Leah Johnston, Ashlee Tozer, Kaitlin McKivat, Hannah Dee, Danica Hunter.